ProDem offer high quality, value for money and reliability with a full line up of attachments. A wide range of spare parts in the UK for a swift response to meet your requirements. ProDem are continuously focusing on the requirements of the changing market and are dedicated to new technologies. Most of all our commitment to you means that together with ProDem you can expect the best. The ProDem PRB Series are vibration dampened silenced hydraulic hammers which have been developed for the toughest kinds of environments.Whilst the PRB Series are fully silenced for sound sensitive job sites, they also provide impressive power for the largest of demolition sites.The PRB range provides more power through innovative durability.The PRB Series (PRB130 upwards) benefit from, "Pro Speed" dual speed control system, anti-blank firing system, auto stop & auto start, rock claws, and a single high pressure accumulator (PRB200 upwards). The PRB Series offer power, reliability, durability, low operating costs and ultimately, customer satisfaction. For complete product specifications, please download the latest ProDem brochure (PDF) by clicking here. For the primary demolition operations. Bringing down the main structure of a building. 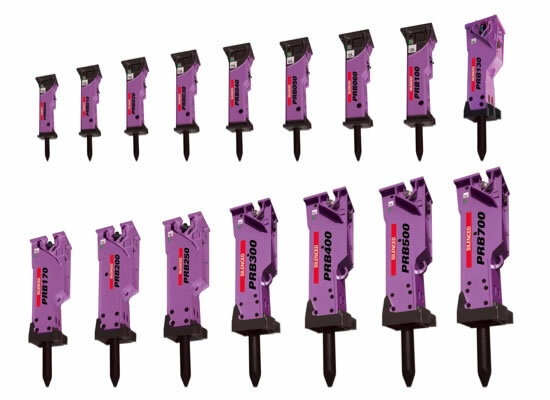 Specially designed and engineered for mixed concrete and steel applications, combining the advantages of Shear Jaw Set and Concrete Jaw Set. Processing heavily reinforced concrete structures and concrete encased I-beam steel barrels without jaw change. For the secondary demolition operations. Starting to process the demolished materials. Separating reinforcing bar from concrete for example. 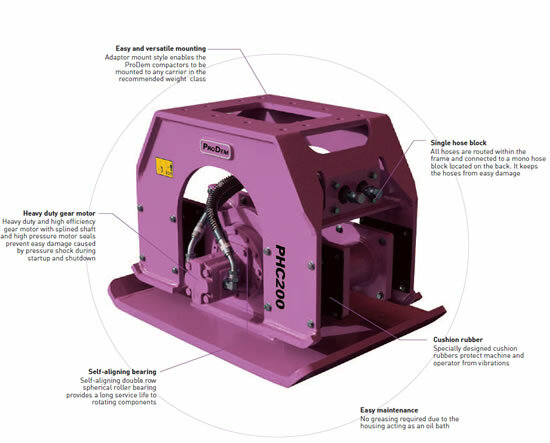 Produced with increased power and durability by state-of-the-art technology, ProDem Pulverisers have been designed for both primary demolition work, secondary concrete reduction and material sorting. Integrated speed up valve with cylinder for maximum efficiency and performance. Trunnion-supported cylinder gives high breaking forces throughout the entire working cycle as well as stable movement. 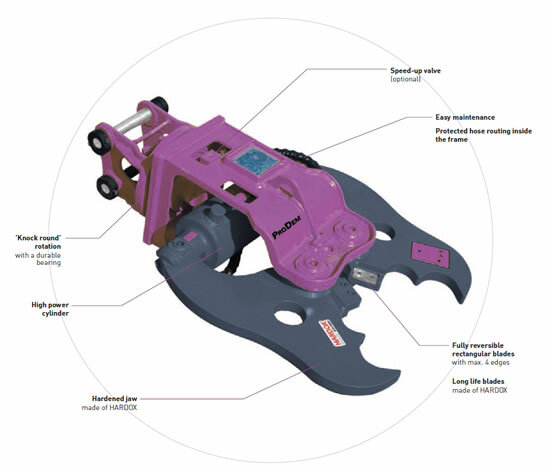 The replaceable tooth system, which is fast and effortless, allows high productivity. 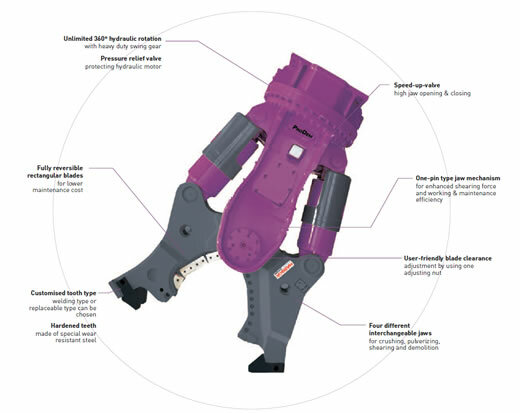 With its wider jaw, exceptional closing force and short cycle times, ProDem pulverisers provide excellent productivity in concrete reduction and reinforced steel separation. Increased durability has been achieved with the use of abrasive-resistant materials. Advanced design and construction produces a powerful and durable attachment to handle to toughest jobs. 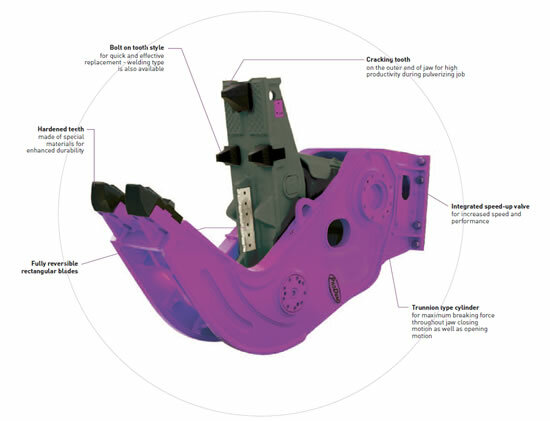 ProDem mini crushers boast rotation without the need to have a hydraulic rotation circuit on your excavator. Hardened jaw of the hardox steel. Wide jaw opening for a large demolition work surface. Light weight but rigid body frame. ProDem hydraulic compactors enable you to maximise productivity and minimise the downtime of your excavator. 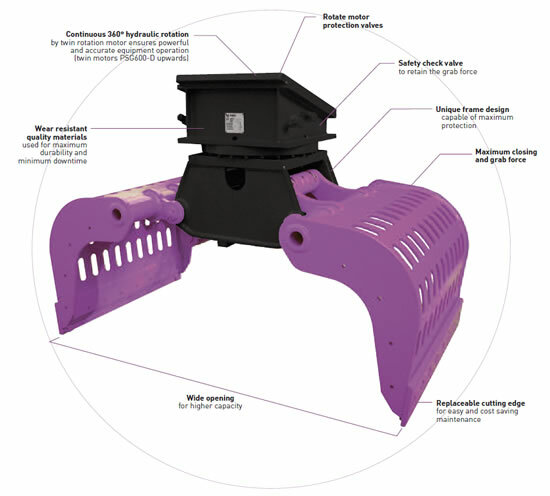 The new PHC series enables compaction of embankments, deep excavations, trenches and sheet piles safely. Built-in cross check valve within motor protects the motor and bearing from damage caused by abrupt shutdown of hydraulic flow. It also eliminates the need for a case drain. Flow control valve (priority flow divider) regulates hydraulic in-flow to the motor and prevents it from over speeding. Thus, the compactor can be installed on carrier not equipped with a flow control valve on its auxiliary plumbing.